India and Russia on Friday signed a document for cooperation to implement new nuclear power project (NPP). 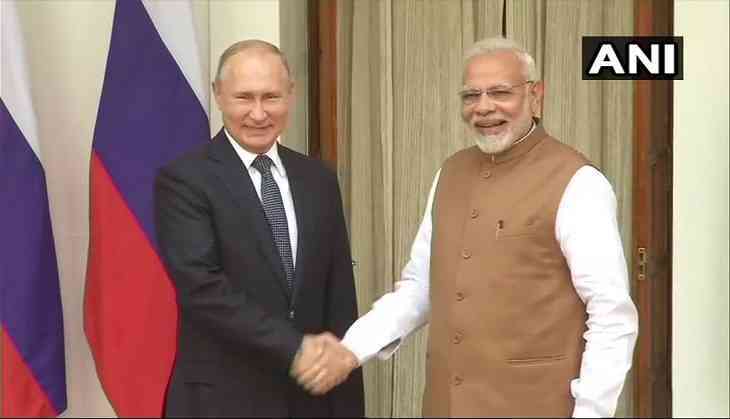 The document was signed following the discussions between Indian Prime Minister Narendra Modi and Russian President Vladimir Putin during the 19th India-Russia Annual Bilateral Summit in New Delhi. The document called an 'Action Plan for Prioritisation and Implementation of Cooperation Areas in the Nuclear Field', was signed by Director General of Rosatom State Atomic Energy Corporation Alexey Likhachev and Secretary of Department of Atomic Energy and Chairman of Atomic Energy Commission Kamlesh Vyas. The two countries plan to implement the project of six nuclear power units of Russian design at a new site in India, as well as further cooperation in third countries in new promising areas of nuclear technology, apart from the construction of nuclear power plants. At present India and Russia are jointly involved in the Rooppur Nuclear Power Plant project in Bangladesh. This is the first initiative by India and Russia in a third country. Since India is not a member of the Nuclear Suppliers Group it cannot be directly involved in nuclear power reactors. According to the document, Russia will offer the reference evolutionary VVER-1200 technical solutions of the generation "3+" for the new nuclear project and will increase the level of Indian industry's involvement and localisation. The pact is expected to be a big boost for Make in India as it will lead to manufacturing of nuclear fuel assemblies in India and majority of the equipments and material used for the NPPs will be made locally. "We are satisfied with our strategic cooperation with India, where we implement the series construction of multiple units of Russian design on the Kudankulam site. We are counting on receiving a contract to implement a series construction of multiple units of our design at a new site in India in the same way. This will significantly increase the localisation of manufacturing the equipment for nuclear power plants in the framework of the policy 'Make in India', as well as optimise the timing and the cost of project implementation. In addition, India is a reliable partner, with whom we are already implementing projects in third countries, and we plan to enhance this cooperation," said Alexey Likhachev, DG Rosatom State Atomic Energy Corporation. VVER-1200 is a flagship Russian nuclear reactor which has 20 per cent more power generating capacity than VVER-1000 that are used in India's Kudankulam units. This Pakistani journalist interviews cattle and can even translate what they are saying!